There are just 4 words that define the Winners Mindset™: Absolute CLARITY of values and vision... unconditional CONVICTION that what you are doing is the right thing to be doing... total COMMITMENT... and the COURAGE to take bold action. 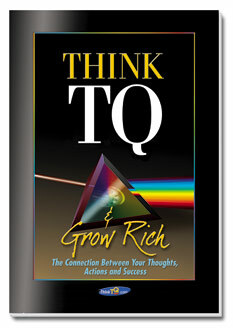 TQ trains winners by helping people discover and unleash their full potential through a measurable, sequential process of self-measurement... self-evaluation... and self-improvement. In this section you will find a sensational array of simple-to-use tools that will transform your native abilities into powerful skills—giving you the edge to out-smart... out-hustle... out-compete and out-produce your competition. 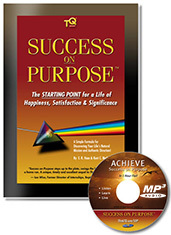 If you want to live a life of passion, purpose and mission—achieving results beyond your wildest expectations—you will find what you need here! If you haven't yet, we highly recommend you START by taking our exclusive TQ Test to see exactly what you are doing RIGHT... precisely what you are doing WRONG... and exactly what you must do DIFFERENTLY to produce greater results — both personally and professionally. In addition to our incredible products and seminars, we offer a full range of highly effective coaching and mentoring programs for people who need to breakthrough to a new level of performance, individually or in their businesses. If you need to put a powerful edge on your performance—FAST—do what the most successful professional entertainers... athletes... and business executives do—get a coach! Want fabulous calendaring tools... day planner and time management tools... eBooks and personal workshops... motivational "signs for success"... even a copy of the Power of TQ personal virtual book you purchased? In our download center you will find powerful new tools to help you continuously improve the effectiveness of your performance.